The Admella Discovery Trail is a scenic self-driving route peppered with numerous natural, cultural, and heritage attractions. 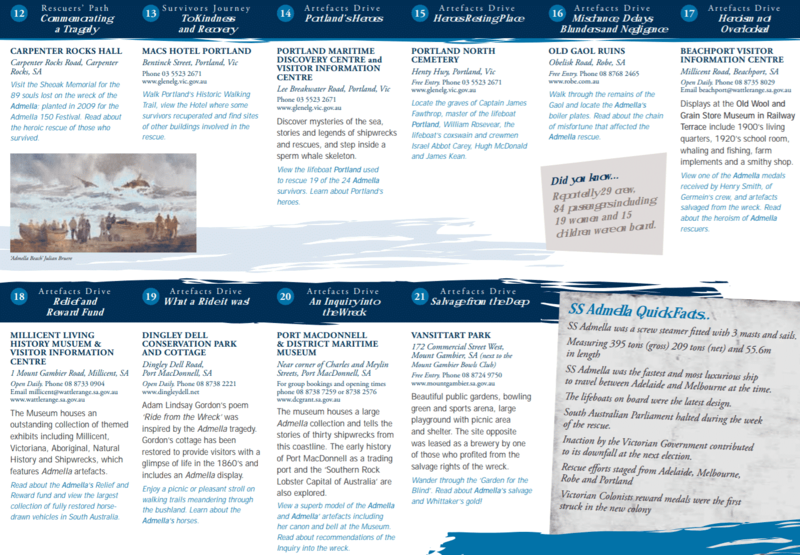 However, the highlight here are the 21 maritime-themed trail markers for you to discover. 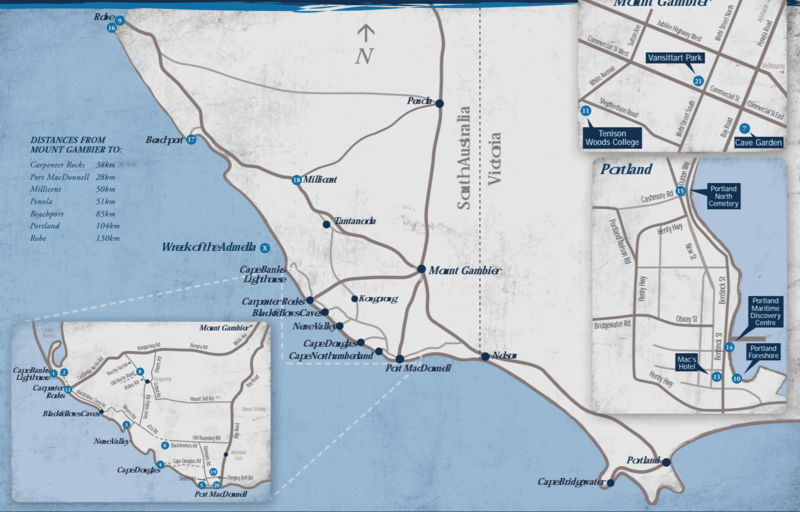 The route is located within a 130-kilometer radius of Port MacDonnell. This trail was established in honour of a tragic historical event, which is when the crew of the SS Admella experienced a horrific fate as they sailed to Melbourne from Adelaide. During the early hours of August 6, 1859, the ship collided with Carpenter Rocks causing 89 people to die. But a miracle happened: 24 people survived the 8 catastrophic days with little food and no water, but it took three days for word to get out that tragedy had struck SS Admella. 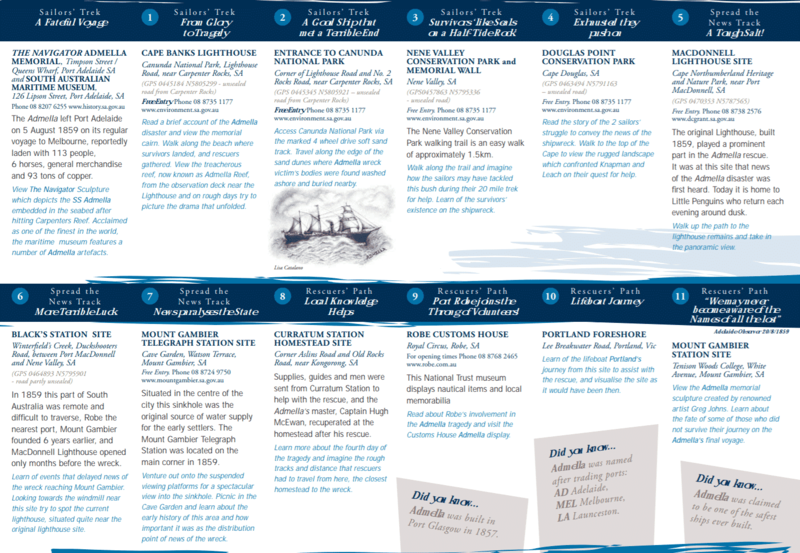 It was considered as one of the worst maritime disasters in Australian history. Visitors taking the trail are able to recount the events as they unfolded. Take a walk along the path where two sailors of the surviving crew trekked to the lighthouse to ask for help. Proceed to the lighthouse where you can stand at the observation deck and take in scenic views of the ocean where the tragedy occurred over a century ago. It feels surreal to be in the same spot, but it also enables you to pay your respects to the resiliency and bravery of rescuers who took part in this mission. 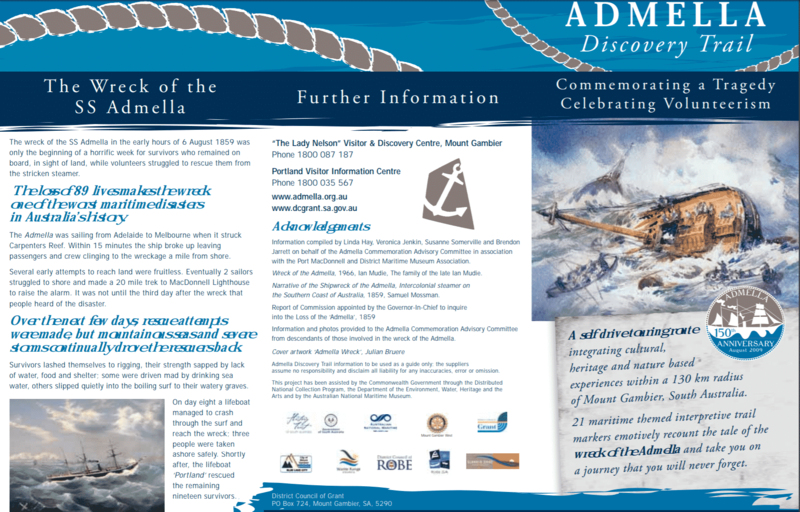 The Admella Discovery Trail also features a maritime museum where visitors are invited to see artefacts on display. These artefacts were salvaged from Admella, and include lifeboats as well as other parts of the ship that have been well-preserved. The whole family can learn from the educational and historical aspects of the route. The Admella Discovery Trail is located at the Carpenter Rocks, southeast of South Australia.